Well a year or so ago my host's server crashed. I didn't know that happened for sometime and when I found out it was gone I just never got around to uploading a very old version of my site. Unfortunately, I don't seem to have a backup with all my gallery quilts. Anyway, I've uploaded the most recent back up I have. I'll try to get around to reworking it soon. I need to optimize the page. I've gotten a new monitor and it doesn't look quite right. My screen resolution is 1152 by 864 pixels. � 2000-2001 Heartland Quilting/Becky Kramer All rights reserved. 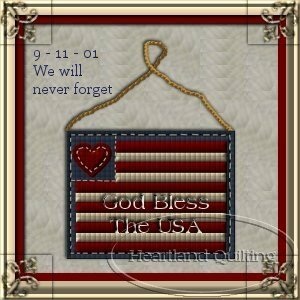 This document may not be copied or reproduced, in whole or in part, in any manner without the written consent of Heartland Quilting/Becky Kramer. All international rights reserved.